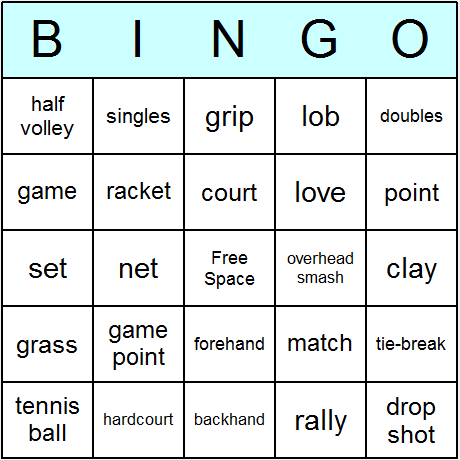 Since we all like a flutter here at The Tennis Tipster, it’s time to have some fun with Bingo! For instance, 75-ball Bingo is the typical game of Bingo played across the United States in Bingo halls everywhere, and online at sites like WeLuvBingo.com. Most often it is played on a card that is five by five. Your goal is achieve the pattern designated and mark off that pattern as you go, or the computer does it for you. Once you have the designated pattern you have Bingo. There will be 75 balls that could potentially be called out, thus the term “75-Ball Bingo”. Back to the topic of Bingo, you can get some practice in by playing some John McEnroe bingo before laying down some cash. 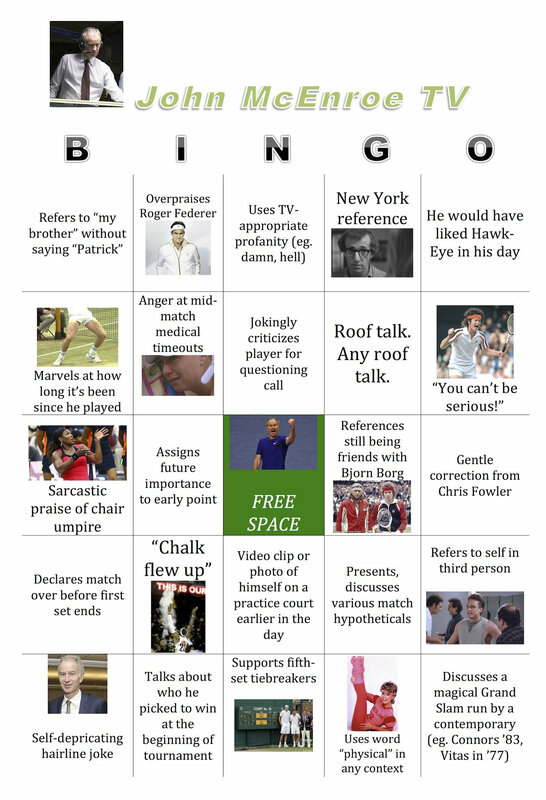 It’s easy, just check off every time Mac Daddy references these topics, using this handy Bingo card courtesy of Yahoo’s ‘Busted Racquet blog‘. Of course, they could also mention Big Mac’s flirting with Sue Barker or underplay how bratty he was when he played. You could also add a “says player should come to the net more often” square. This is the kind of game that would work with a few others, perhaps Mary Carillo or Brad Gilbert including one of my favorite Bradisms, “Taking him to the woodshed for a beating”. My new favorite commentator is Robbie Koenig with his South African lilt and coining the term “Roddickulous!”. Leave your comments below with ideas for ‘commentator bingo’. It’s the perfect way to enjoy Wimbledon during changeovers or rain delays!